The Metropolitan line's station at Kings Cross was originally opened at a point eastward of the tube one that exists today. Links were built through to the Great Northern Railway at Kings Cross and the Midland Railway at St Pancras. 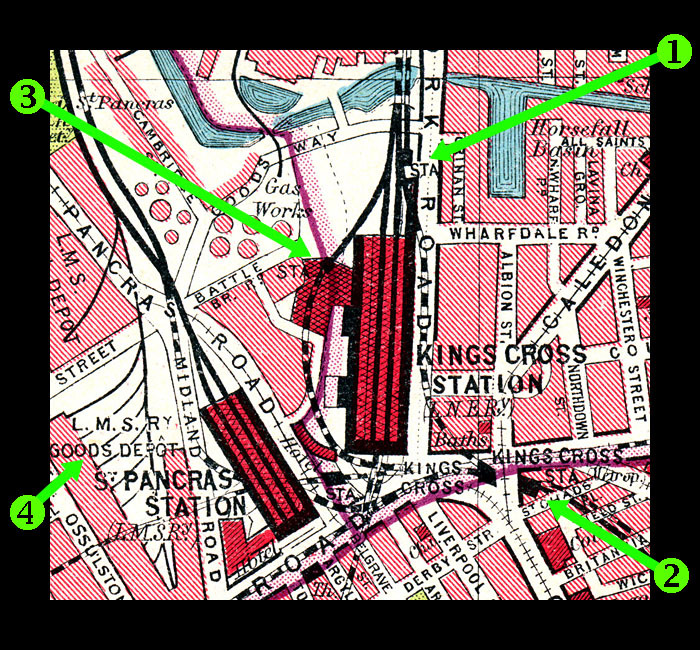 The subsequent heavy traffic (goods & passenger) necessitated an extra two tracks being built from Kings Cross to Moorgate (known at the Widened Lines) and extra platforms were added at all of the intermediate stations. At Kings Cross mainline terminus, two platforms were built on the tracks connecting the Widened Lines with the mainline rails. The southbound track and tunnel was built on the east side of the mainline station and the one-platformed station was called Kings Cross York Road. The northbound track and tunnel looped round to the west side of the mainline station. The platform built here was called Kings Cross Suburban station. Although both the platforms were termed 'stations', they were really just annexes of Kings Cross mainline station. 1930s map showing the Kings Cross area. (2) The original location of the Metropolitan Line's station and the Widened Lines station. The Metropolitan Line station was moved closer to the deep level platforms in 1941 and the Widened Lines station was moved to St. Pancras in 2007. (4) The location of the goods depot attached to St.Pancras station. The British Library sits there now. The very southern end of the Kings Cross York Road platform showing the track entering the southbound tunnel, before closure. The tunnel is no longer in railway use. The track between Kings Cross York Road platform and Kings Cross Widened Lines station (also known as Kings Cross Thameslink station) is in tunnel except for this short section, visible from the new Regent's Quarter development in Kings Cross. This is believed to be a photo of the same open-air section of track, facing southward. The tunnel is still extant but no longer in railway use. The platform on the other (western) side of Kings Cross station, the Kings Cross Suburban station/platform. This platform and the higher level ones to the left, have been demolished or buried beneath the works at Kings Cross station.